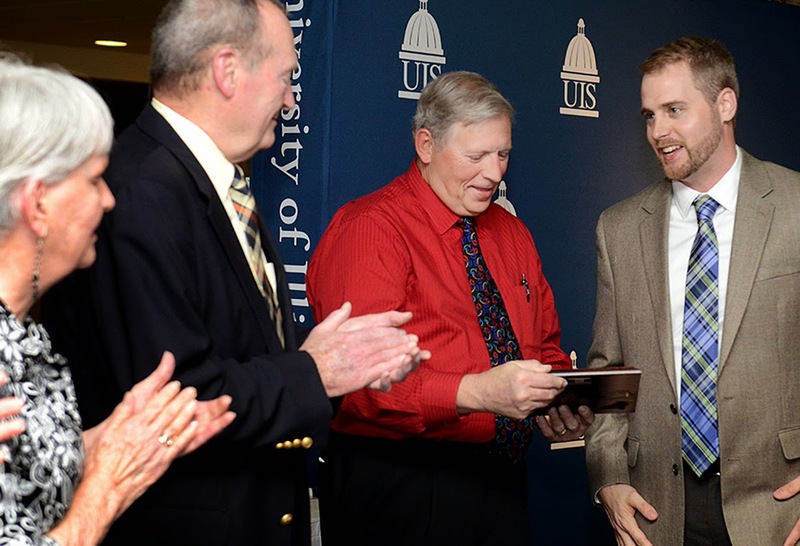 The University of Illinois Springfield, the Junior League of Springfield, and the United Way of Central Illinois honored more than 60 Sangamon County volunteers and businesses during the annual Good as Gold Ceremony. The event was held on Wednesday, April 15, 2015 in the Sangamon Auditorium Lobby at UIS. Edward ‘Ed’ Hohenstein of Springfield was honored with the 2015 Distinguished Volunteer Award. He volunteers full-time for Habitat for Humanity of Sangamon County. During 2014, he committed to be the general contractor for the build out at the organization’s new headquarters on South Sixth St. in Springfield. Hohenstein has also brought two new programs to Habitat. One project developed, and trained volunteers to build pallet furniture and other reclaimed items to be sold in the Habitat Restore. He secured a location for building the items, found a steady stream of pallets and venues to recruit new volunteers. Over a 5 month period, he recruited over 100 new volunteers and sold more than $10,000 of pallet items to support Habitat’s programs. The other program started by Hohenstein was a wheel chair ramp installation program through Habitat’s Critical Home Repair objective. His effort brought with it an additional $10,000 in startup funding as well as a trailer to carry the supplies needed to build the ramps. He trained volunteers to survey the property for the ramp installation, apply for the building permit, assemble the ramp parts, and install the ramp. Finalists for the Distinguished Volunteer Award included Neill Howey of Hope Church, Elizabeth 'Liz' Magee of Mini O'Beirne Crisis Nursery, and Cindy Wilson who volunteers with 4-H and Girl Scouts. 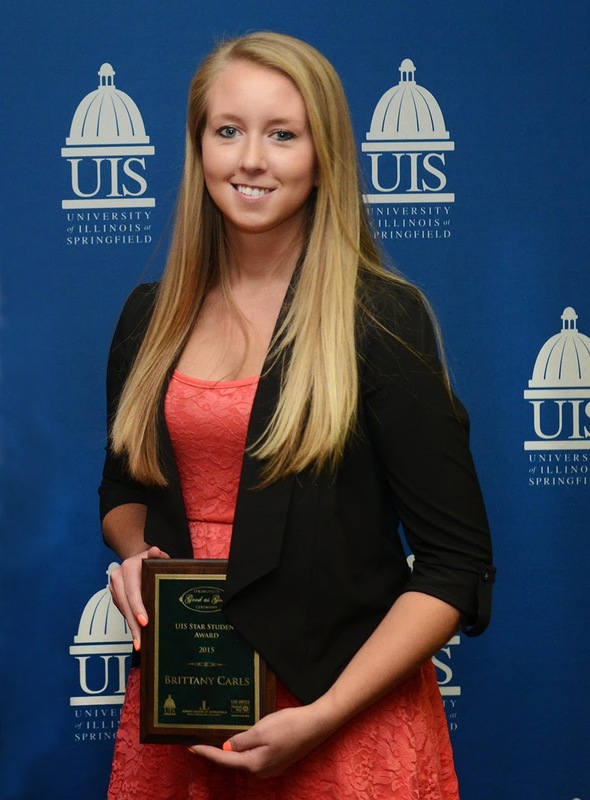 UIS student Brittany Carls of Arenzville was honored with the Star Student Award for her volunteer efforts. She serves as the co-director for Leadership for Life service and leadership program overseeing and volunteering at various events in the Springfield community, including the UIS Homecoming service project, a local prairie restoration project, and a recent Kumler Outreach Hospitality House night. She also recently completed an internship with Habitat for Humanity and outside of her internship and leadership positions, has completed over 350 hours of service in the past year. Other UIS students nominated included Nicole George and Brittani Provost. The Star Staff Award was given to Karen Lee, a visiting clinical instructor in the UIS Department of Human Development Counseling Program. She is retired from the SIU Medical School and is very active within the arts community. She has provided support for Alzheimer patients, their families and caregivers and given them a place to voice fears, concerns, hopes and dreams. Thirty-six local volunteers were also honored with the Heart of Gold Award. Recipients included: Darrel Berry, Jennifer Bosaw, Analy Camacho, Rae Clementz, Ann Collins, Brian Davis, Nicole Evans, Daniel Hughes, Annette & Paul Jaderholm, Karen Jeffers, Stan Johnson, Sarah Jones, Cecine Jones, LeAnna Kehl, Ruth Elaine King, Frances Lenhart, Kathryn Kleeman Lesniak, Frank Lynch, Cheryl McKnelly, Connie Miller, Pamela Nation, Randy Pope, Steve Read, Heather Schneider, Melissa Skinner-Liberman, Kevin Smith, Jim Struebing, Jennifer Sublett, Steve Sullivan, Jeff Threlfall, Kim Tribbett, Mattie Watson, Vernon Wilson, Rodney Womack and Mary Yokem. The winner of the 2015 Organization Agent of Service Award is Habitat for Humanity of Sangamon County. In 2014, Habitat celebrated its 25th anniversary. In those 25 years, 97 homes have been built, with 4 of those completed in 2014 and they plan to kick off their 100th house build this Saturday. In addition to new construction and renovating existing homes with the “Brush with Kindness” program, in 2014 they added a new program installing wheelchair ramps. Habitat has continued its pallet furniture making and began work on their new office and ReStore location on South Sixth St., which they moved into earlier this year. A total of 24 Sangamon County businesses were named to the Business Honor Roll sponsored by the UIS College of Business and Management and supported by The Greater Springfield Chamber of Commerce. The honor roll recognizes businesses that have made giving back to our community a priority. Businesses making this year’s honor roll include Ameren Illinois, Bank of Springfield, Brandt Consolidated, BUNN, Farmers Insurance, H. D. Smith, Heartland Credit Union, Illinois Association of Realtors, Kerber, Eck & Braeckel, Marine Bank, Mayfield Insurance and Financial Services, Memorial Health System, Noodles and Company, Orthopedic Center of Illinois, PJP Auto Enterprises, President Abraham Lincoln Hotel, R.W. Troxell & Company, SCHEELS, Small Business Growth Corporation, Steve Koch/Ameriprise Financial, Terry Farmer Photography, United Community Bank, US Bank, and Wells Fargo Home Mortgage.